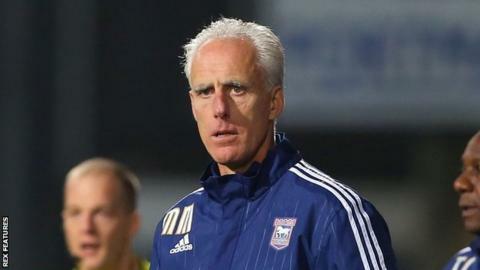 Ipswich Town manager Mick McCarthy says he is happy with his squad and will not look to bring in new players in the January transfer window. McCarthy won the Championship manager of the month for November after his side took 10 points from a possible 12. "We had a great November but we'll need to have more good months to make the play-offs," he told BBC Radio Suffolk. "It's a tough league. You can have a good run, and if you get that then you get back up the league as we did." Following Ipswich's return to form in November, which also led to Daryl Murphy being named Championship player of the month after a return of six goals in four games, McCarthy believes they have the quality to sustain their challenge. "Teams have spent a lot of money [in the Championship] and added to their squads, and we'll be as competitive as ever and try to get in the play-offs," McCarthy added. "If I can get Ryan Fraser, Teddy Bishop and everybody fit, then let's give the lads who have been brilliant for Ipswich a chance without me bleating on about needing something else. "I'd be happier to support the ones I've got than look for someone different."